In previous posts I have looked at the Movement for a Democratic Society (MDS)and its offshoot organisation, Progressives for Obama. The two organisations unite all the main radical strands behind the Obama movement. Democratic Socialists of America (DSA), Communist Party USA (CPUSA), Committees of Correspondence for Democracy and Socialism (CCDS), former members of the ultra radical Students for a Democratic Society (SDS) and its terrorist splinter the Weather Underground. Several of these currents came together in the mid 1990s to form the New Party. Barack Obama joined the New Party in Chicago in 1995 and recieved their support and endorsement in his successful 1996 Illinois State Senate race. In June 1998, radical black activists including many key leaders of the New Party came together in Chicago to form a new organisation-the Black Radical Congress (BRC). It seemed to us the idea of bringing together the varied sections of the Black radical tradition - Socialists and Communists, revolutionary nationalists, and radical Black feminists and womanists - was long overdue. We began talking with others about the idea and possibilities for such a gathering. In March of 1997, some 70 activists from more than twenty cities across the country came together in Chicago to begin planning for a Black Radical Congress. Those who gathered reflected a broad spectrum of the radical tradition. Participants came as individuals but represented connections to groups ranging from New Afrikan People's Organization, Black Workers for Justice, The Labor Party, The Communist Party, The Malcolm X Grassroots Movement, African American Agenda 2000, The Chicago Ida B. Wells Forum and the Committees of Correspondence. This group agreed to host a Black Radical Congress and constituted itself as the continuations committee...Three subsequent national meetings of the continuations committee were held in Washington, D. C., in May of 1997, in Atlanta in September, 1997, and most recently in New York City in January of 1998. A "Call for the Congress" was drafted and issued with the names of over 100 conveners. Sisters and Brothers, we stand at the edge of a new century. The moment for a new militancy and a new commitment to the liberation of all Black people, at home and abroad, has arrived. Let us build a national campaign toward the Black Radical Congress, setting in motion a renewed struggle to reclaim our historic role as the real voice of democracy in this country. Spread the word: Without struggle, there is no progress! Now’s the time! Salim Muwakkil (Chicago, writer for the DSA linked magazine In These Times). There is some continuity with this group. Manning Marable, Bill Fletcher and Cornel West were all leaders of the New Party. Bill Fletcher, Robin DG Kelley, Gerald Horne, Charlence Mitchell, Angela Y Davis and Akbar Muhammad Ahmed have all served on the board of Movement for a Democratic Society. Manning Marable was elected MDS chairman in February 2007. Bill Fletcher was the initiator of Progressives for Obama, while Robin DG Kelley, Cornel West and James Campbell are endorsers of the organisation. Prexy Nesbitt is a signatory of PFO's online petition. Many of those listed have been busily supporting Obama, directly or indirectly. Michael Dawson spoke with Obama at a 1996 forum on Economic Insecurity sponsored by the University of Chicago DSA Youth Section, Chicago DSA and University Democrats. Gerald Horne, who has studied the Communist Party in Hawaii was the first to publicly link Barack Obama with his boyhood mentor, long time CPUSA member Frank Marshall Davis in the CPUSA journal Political Affairs. Robin DG Kelley will deliver Hampshire College’s eleventh annual Eqbal Ahmad Lecture on October 15th in the Robert Crown Center. His talk will be titled "Confronting Obama: A Primer on Race and Empire for the New U.S. President." 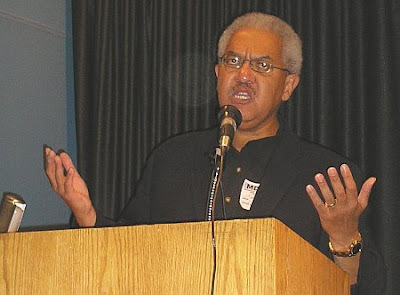 Manning Marable strongly endorsed Obama in a January 2008 article entitled “Barack Obama’s Problem – And Ours"
Dee Myles penned this pro-Obama piece for the Illinois Communist blog. Salim Muwakkil is a prominent propagandist for Barack Obama. Barbara Ransby spoke at this forum in Chicago at The Center for Public Intellectuals & The University of Illinois-Chicago (UIC)April 19th-20th, 2002 with Bill Ayers, Salim Muwakkil and Barack Obama. Experiences and applications of intellectual work in urgent situations. Jarvis Tyner has been busily criss crossing the USA drumming up support for Obama. Cornel West is Obama's "comrade". spiritual motivation in the radical/liberation movement? Well fancy that? Obama's pastor discussing "faith as a weapon" with Michael Eric Dyson and Cornel West-both members of the Religion and Socialism Commission of Democratic Socialists of America-not to mention kevin Tyson, formerly involved with the youth wing of CPUSA. Cornel West, (Progressives for Obama, advisor to Obama) was a strong defender of Jeremiah Wright when the pastor's extremist views became a public scandal. 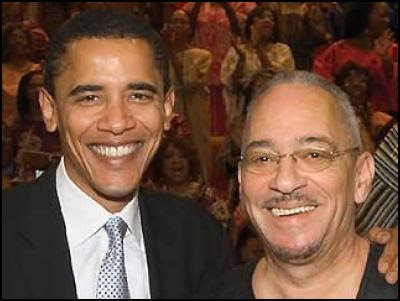 Likewise his comrade Michael Eric Dyson has been a strong defender of both Jeremiah Wright and a prominent supporter of Barack Obama. So Obama's pastor of 20 years was an associate of some of the most radical communists and socialists in the US. Maybe that's where he got some of his ideas from-the ideas that Obama didn't notice. Many of those radicals are now prominent Obama supporters. What a tiny world we live in. Drive? He's already there Cameron. You are always much more optimistic than me Trev! IN OTHER NEWS.. WHITE RADICALS FOR McCAIN! Come on, don't play the race card.